The collapse of the Soviet Union, the transition to a market economy, the ban on the Communist Party, the complete transformation of the public and the economic structure of the country — all of these followed the coup attempt on Aug. 19-21, 1991. The collapse of the Soviet Union is one of the consequences of the putsch of Aug. 19-21, 1991. The Soviet leadership attempted to overthrow Mikhail Gorbachev from his post as president of the Soviet Union on the eve of the signing of the New Union Treaty, which was planned for Aug. 20. The treaty called for redistributing power to the leadership of the country, as well as for the resignation of most of the ministers. Almost all of the members of the Soviet government were involved in the plot. Mikhail Gorbachev was confined to his house in Crimea, where he had been vacationing. It was announced that Gorbachev had resigned due to an illness, and a state of emergency was announced in the Soviet Union — political freedom and freedom of expression were to be prohibited. The plotters called themselves the State Committee on the State of Emergency (GKChP). The struggle against the conspirators was headed by the president of Russia, Boris Yeltsin, who had been elected just two months earlier. Yeltsin labeled the situation a "reactionary unconstitutional coup d’état." 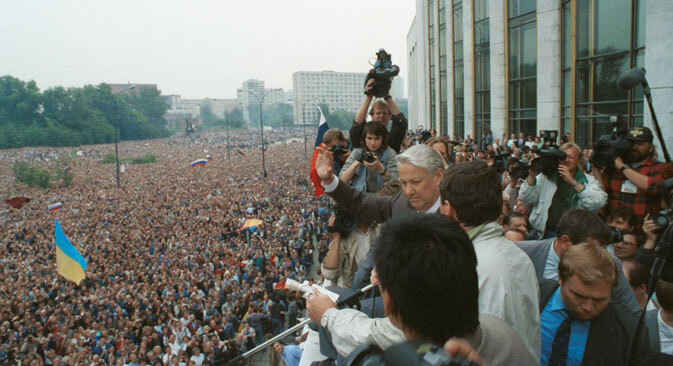 Tens of thousands of Yeltsin's supporters gathered around the president’s residence at the White House in Moscow. The special forces sent to arrest Yeltsin did not do so, worried that it would cause bloodshed. After this, the conspirators themselves panicked, headed for Crimea to negotiate with Gorbachev… and returned under arrest. The failed coup helped secure Yeltsin's victory in his power struggle with Gorbachev. By Aug. 23, 1991, Yeltsin issued a decree suspending the activities of the Communist Party and, on Nov. 6, 1991, the party was banned and its property was confiscated — so ended the party of around 20 million people that held the country together. On Dec. 8, 1991 Yeltsin, together with the leaders of Ukraine and Belarus, dismantled the Soviet Union and established the Commonwealth of Independent States (CIS) in its place. On Jan. 1, 1992, the Russian government abolished state price regulation, thereby establishing a market economy in Russia. In the 1990s, Russia experienced a few more crises, including President Yeltsin’s dissolution of the Russian parliament in October 1993; the deputies tried to impeach Yeltsin in response. Then followed the economic default in August 1998: The government could not pay its debts, many banks collapsed and the ruble lost two-thirds of its value against the U.S. dollar. In addition, after the Soviet Union dissolved, six former republics were caught up in conflicts; this included Russia, which tried to take back the rebellious Chechnya. This changed Russians' attitude toward the events of August 1991. Sociologist Yuri Levada believes that the failure of the coup was perceived as a victory for democracy only for the first one or two years afterwards. By the mid-1990s, according to Levada Center data, only 7 percent of the people felt that the failure of the coup was a victory for democratic revolution and liberation from the Communist Party. For the rest, it was either a struggle for power among the country’s top leadership, or a tragedy with crippling effects for the people. Removing the aftermath of the putsch became the main objective of the second president of Russia, Vladimir Putin, who came to power in 2000. After a year, the United Russia party was established from several pro-government political factions and was destined to be analogous to the Communist Party of the Soviet Union. Simon Kordonsky, a professor of economics who worked from 2000-2004 as the chief of expert management in the administration of the president of Russian Federation, explains that the Communist Party represented all segments of society in the same way as the people's assembly did in czarist Russia; it and served as a social elevator, allowing common people to make a career in government. In post-Soviet Russia, there were no such social elevators. It was not possible to get a spot in government by becoming a member of the United Russia party, either. Kordonsky notes that Putin's economic policy was also aimed at the redistribution of resources, in favor of those at a disadvantage in the market-oriented society: security agents, state employees and pensioners. According to the economist, this made Putin popular, but it has led to ballooning public expenditures. Russia also did not become a center of attraction for post-Soviet republics. Alexei Malashenko of the Carnegie Moscow Center explains that Russia had nothing to offer the other republics: "We export raw materials, and they do too. Our industrial products are not competitive." According to Malashenko, schools in post-Soviet republics prefer to teach English instead of Russian, and young people are trying to emigrate to the West, not to Russia. The governments of these countries pursue a so-called multivector policy, the essence of which is avoiding long-term alliances and cooperating with all of the major powers, including the United States and China. The most that Russia has been able to do is establish a customs union with Belarus and Kazakhstan in 2010. The participants in the August Putsch were granted amnesty in February 1994 by the State Duma, putting an end to the political confrontations in the early 1990s. Previously, the participants of those events lamented the fact that they did not act decisively enough and could not achieve their goals. The conspirators could have won, if they would have had different mottos and a charismatic leader, believes Kordonsky. According to him, the events the early 1990s are comparable to the liberal reforms of the 1860s, which included abolishing serfdom. Just as these reforms resulted in a conservative reaction after the Bolsheviks (who reconstructed caste society) came to power, the liberalization of the 1990s were replaced by the reactionary 2000s. Kordonsky believes that a majority of Russians are accustomed to a system in which the state accumulates all of the resources and then distributes them. It is no coincident that the protests against the coup took place only in Moscow and the Baltic states — the rest of the country simply waited to see what would happen.